Unsettled weather remained over the northwest Caribbean for nearly a week. 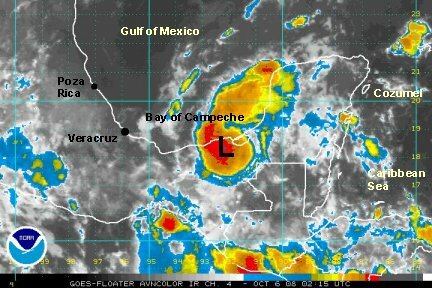 That unsettled weather almost became a tropical depression before it moved inland on the southeastern Yucatan of Mexico. Convection has been increasing and a mid-level and possibly a low-level circuatlion will be moving into the Bay of Campeche Monday. It will continue to move wnw then back inland into Mexico again in about 36 hours. It's possible that this system may become a tropical depression and even a tropical storm before making a second landfall somewhere inbetween Veracruz and Poza Rica. Last edited by Caribbean Traveler on Mon Oct 06, 2008 3:38 pm, edited 3 times in total. A low pressure system has now drifted into the Bay of Campeche. The visible satellite imagery shows what appears to be a low level circulation. Unfortunately, the Quickscat "missed" this area on its most recent pass so no data is available. There is also no buoy data or ship reports to study either. At this point we don't think it's quite a tropical depression yet, but could be soon. Convection is holding on over the circulation center and if it expands should allow for some development. It's possible that this system may become a tropical depression and even a tropical storm before making a second landfall somewhere inbetween Veracruz and Poza Rica. The National Hurricane Center surprized us and named the disturbance tropical depression 13. We were thinking that they would wait until this afternoon. There is actually no change from our previous forecast. it should move wnw and stay over water for about another 24 hours. NHC makes It a tropical storm as we mentioned was possible in our earlier updates. 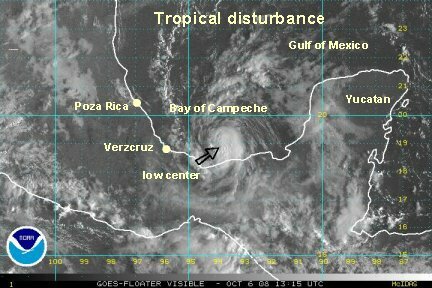 Look for a second landfall somewhere in between Veracruz and Poza Rica. The National Hurricane Center certainly has this one on the fast track. We came across an intragovernmental site that already has t.d. 13 upgraded, so, it looks like that will be the case of the 5 pm edt advisory. Marco is a tiny system. A low level circulation is very discernable. The convection today has persisted and maybe increased a touch. An unannounced Hurricane Hunter found a flight level wind of 61 knots. This must have been a downburst. NHC adjusted the flight level winds to a surface representation of 65 mph! We simply can not agree on this one. It looks to barely be a tropical storm of 40 mph. Advisories have been issued for the Mexican coast. 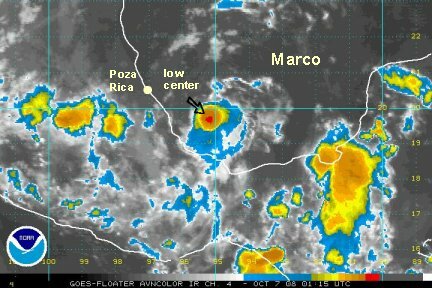 Tropical storm Marco will not live long. 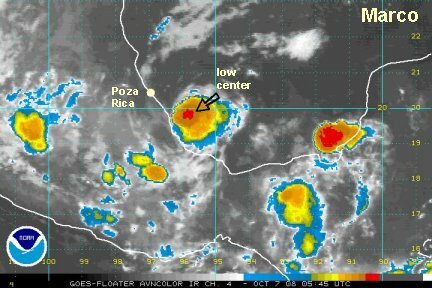 Look for a landfall somewhere near Poza Rica by 24 hours. Satellite imagery still shows a very unimpressive signature. We are having a tough time believing that this is a 65 mph tropical storm. The thunderstorm area is only about 30 miles in diameter. This is about the smallest we have ever heard of. We still believe that the Hurricane Hunter earlier must have sampled a downburst and the winds we NOT representative of the low. We still think Marco is about 40 mph. Tropical storm Marco is moving wnw and will move inland by noon Tuesday. Landfall somewhere near Poza Rica. Officially tropical storm Marco remains at 65 mph. With a 65 mph tropical storm, one would expect gusts to around 80 mph. The last microwave estimate from early this evening gave a wind of 41 knots. Also, the most recent Quickscat satellite imagery didn't even have a closed low. We'll be generous and say that Marco is still holding onto 40 mph winds. The Hurricane Hunter measurement has led the hurricane center to hold onto a 65 mph winds for many hours now. We just don't think this is close. 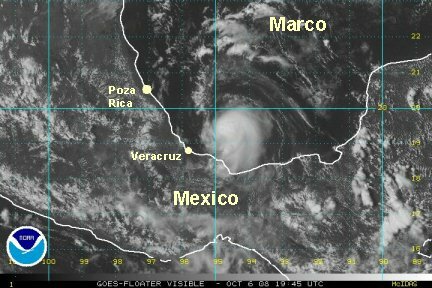 Marco should be inland near Poza Rica in a few hours and will weaken very rapidly. With its small structure, there will be only a very limited zone of surge and probably not much either, somewhere in the range of 1-3'. This will be our last update on Marco.